Google announced today that Gmail users can now make free calls from a computer to a phone. The service will be free for calls in North America until at least the end of the year. Until now users could call other Gmail users' computers for free, but now the service is expanded to phones, including international calls at rates as low as two cents a minute. This is another step forward for Gmail and certainly an attempt at competing with other leading Internet telephony providers like Skype. Gmail's international rates appear comparable to Skype's, which start at 2.1 cents per minute for 30 countries. Skype's non-subscribers are charged a connection fee for international calls and even domestic calls to landlines or cellphones cost money. Gmail's call feature doesn't appear to charge a connection fee, but the international rates Web page does tell users that the rates could change at any time. The new Google service could be useful in any number of situations, including several that Google illustrated this morning in a blog post . "Google Voice lets you manage all your phone communications and seamlessly make and receive calls on any of your existing phones. But what if you don’t have your phone with you? Or what if you’re in a place with poor cell phone reception, or you’re travelling internationally and don’t want to incur expensive roaming charges? Wouldn’t it be great if you could use your computer to make or receive calls?" Google software engineer Nick Foster wrote in a blog post this morning. Gmail users (who have installed the voice and video plug-in) can expect to see a new "Call phone" entry under the chat section within the next few days as the service is rolled out in the U.S. According to a Google blog post, the "Call phone" service works just like any normal telephone. 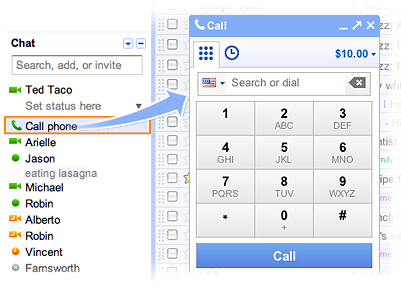 You click on the "Call phone" button in Gchat and it will open a window with a keypad to enter the phone number of contact name and hit the "call" button. I like this development. Thank you. Just for U.S. ? As i don't live in u.s. ; it's just a good development for google. i wait for a day , that it's available for us. Is this offer still on.? Website Reviews; Is it legal or not?